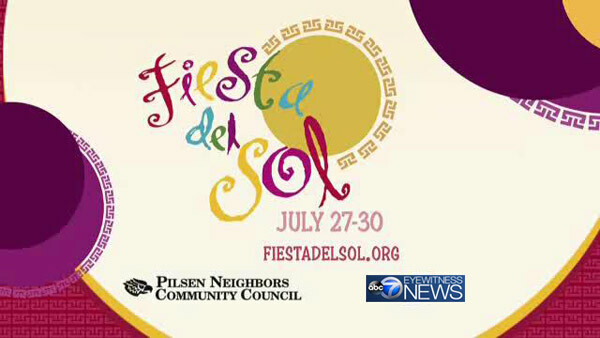 CHICAGO (WLS) -- ABC 7 will continue its support of the Pilsen Neighbors Community Council by once again participating in a summer favorite, Fiesta del Sol. ABC 7 Chicago is the media sponsor of this four-day festival for the fourth consecutive year. ABC 7 Chicago Eyewitness News members Tanja Babich, Stacey Baca, Ravi Baichwal, Terrell Brown, Cheryl Burton, Michelle Gallardo, Leah Hope and Val Warner will be greeting people at the ABC 7 booth on Saturday, July 29 and Sunday, July 30 between 12:30 pm and 5:30 pm. The ABC 7 booth will be located at the corner of Cermak Road and Racine. Festival goers stopping by the booth will have the chance to take photos with on-air anchors and reporters, check out the ABC 7 storm tracker truck and receive some fun ABC 7 giveaways. Below is the schedule for the ABC 7 Eyewitness News team and Windy City LIVE host at the booth. This four-day family event draws over 1 million visitors and is free to the public. Billed as the largest festival in the Midwest, Fiesta del Sol is brimming with live entertainment, local art, a variety of delicious food, carnival rides, a children's area, soccer games and educational resources for parents and youth. This festival is organized by the Pilsen Neighbors Community Council, a non-profit organization celebrating 61 years of service to the community. Fiesta del Sol is the Pilsen Neighbors Community Council primary fundraiser for its scholarship program as well as the organization's year-round community organizing efforts. John Idler, President and General Manager, ABC 7 Chicago said, "Partnering with an important organization like the Pilsen Neighbors Community Council has been a great experience. Fiesta del Sol gives us a chance to meet some of the people that make Pilsen such a wonderful Chicago neighborhood." According to Manuel J. Medina, Board President, Pilsen Neighbors Community Council, "This year, we are very excited to celebrate Fiesta del Sol's (FDS) 45th year. We are proud to feature our new special initiatives in Education (College Fair), Civil Justice (Expungement Event), and our opening reception focusing on the importance of education and scholarship support as an investment to our next generation of Latino leaders. These activities, and our continued focus on celebrating all that Pilsen brings to the region, is what makes Fiesta del Sol a hallmark event that will once again attract over 1,300,000 visitors over the festival's four-day celebration."